If cancelled, modified, or in the case of a no show, 100% of 2 nights stay will be charged. 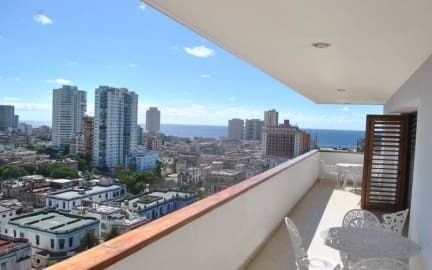 Our property is located in Vedado, Havana's entertainment district, 500m from the Malecon. The sunny outdoor balcony in our guesthouse has breath-taking views of the city. Here you can enjoy our breakfast with organic products and the finest Cuban coffee. Breakfast is not included, extra-fee may be applied. An easy-going atmosphere makes it great place to just relax, sit in the sun, meet fellow travellers and learn about Cuba through the eyes of a Cuban family. Casa Lilly takes pleasure in ensuring that you get everything you need during your stay. Someone is always available to help you with tourist information, nearby attractions or safe accommodations in other provinces of Cuba. Casa Lilly offers comfortable rooms for a reasonable price. 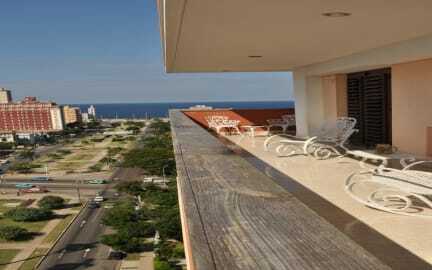 Vedado is a Great location for an unforgettable stay Havana. Vedado has a vibrant night life with jazz clubs, cinemas, theatres, nightclubs, cabarets, and much more. Within 2 blocks from Casa Lilly you have you have 3 of the best restaurants in Havana: El Idilio, Mediterraneo and VIP Havana. Casa Lily offers spacious rooms. The property offers private en-suite rooms and a fully-equipped apartment. The spacious apartment has room for up to 4. Luxurious furnishings will make your stay here a wonderful experience. No curfew. No unregistered guests will be accepted.